Meet in your hotel early in the morning, our Rep will pick you up and transfer to Cairo airport to get short flight to Luxor. Meet in airport upon arrival then transfer with your personal guide wander the temple of Karnak which is the biggest worship place in ancient history. This temples complex been started early over 2000 years and changes been made age after age. Move onto Luxor temple devoted to the Sun god Amun Ra. It is possible to get some free shopping time in Luxor city before transfer you to hotel and overnight. Your day of sightseeing would start shortly after breakfast in hotel then then you will cross to the River Nile to Luxor West Bank. Stop first at the 2 quartz Colossi of Memnon standing on the road 15 minutes to the Valley of Kings, continue to the Valley Kings where cut in rocks tombs for 62 famous kings of New Kingdom, they all are highly decorated and filled with priceless art work. Proceed to Hatshepsut temple built and named after the powerful Queen Hatshepsut the only woman who ascended the throne of Egypt in ancient times. 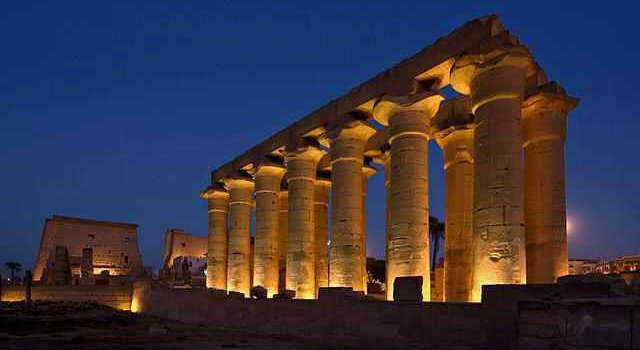 Evening transfer to Luxor airport then fly back to Cairo and transfer to your hotel in Cairo.